At some point, I decided that I should start a baby registry and headed over to Big Box Baby Store. Sure there are hip alternative indie shops where I would to order cool clothes, organic beds, and free range toys (huh?) but I have to keep in mind that those shops tend to be spendy and most folks wouldn't have a clue where to look. And I know, it's not all about folks buying things for the baby but in reality, they want to so I must oblige AND make it easier. I set up my account and cocked my head at the computer when it asked me what the theme of the baby's bedroom is. Wha? I don't know...a baby theme? I left that blank. And then I noticed that it had a suggestion for new parents so of course, being a new parent and more clueless than you would care to know, I clicked. DEAR GAH! The list seemed endless with different categories and items clearly I could not identify. And being the savvy consumer (well with the exception of seeing pretty red shoes on Zappos and ordering them without hesitation), I knew that Big Box Baby Store wanted me to BUY! BUY! BUY! and I knew I needed help. So what's a girl to do? Email Opposite Twin, my dear friend who recently had a beautiful baby boy and incidentally was the only one who guessed correctly that The Prof and I were having a boy. Being even more consumer savvy than I, she directed me to the best book in the entire universe: Baby Bargains by Denise Fields. Amazon soon sent me this glorious book and I sat on the living room couch for two straight hours absorbing this great masterpiece. In fact, I didn't notice when the sun had gone down and I barely felt the need to turn on a light. The author provided insights on where to buy items, what manufacturers avoid, what I definitely need to purchase new, why I should avoid baby stores for certain items, and what I absolutely do not need to purchase. It was like the sky opened and Irish Wolfhound angels sang to me and all was right in the baby shopping world. What does this all mean? First, I do not need to purchase every item on the the registry list just because it is suggested or strongly suggested by Big Box Baby Store. Second, research is key to being a smart consumer. Without helpful tips from experts and experienced friends, it is easy to become overwhelmed by the choices. Third, I can be creative when it comes to certain items like dressers, rockers, and book shelves. I don't need to buy a matching furniture set for someone who really could not care less. I can use antique dressers handed down by family, stain unfurnished bookshelves (or at least The Prof can) and look at rockers and gliders at regular furniture stores. Plus, the baby does not need every loud, shiny, blinky toy on the market. In fact, The Prof and I would rather he not have those types of toys. Our dear friends in Boston have a lovely boy nearing two years old and I admired the minimal amount of toys he had. Most of the toys were educational and his father made blocks for him with which he loves to play. And can I say that this little boy speaks better than some adults I've encountered. Finally, consult someone, and that is Opposite Twin, for advice on what she liked, didn't like, and what we will absolutely need. So here are our goals: we plan on sticking to the basics and buying only what is absolutely necessary. There is no need to decorate with an elaborate theme with all the matching lamps, curtains, and bedding when we all know everyone will become sick of it. Being the hippy liberals we are: we plan on sticking with educational toys, books and I'm sure when he's old enough, many many chemistry sets. And of course, being hikers, we plan on introducing him to the wonderful world of the camping, hiking and eventually skiing. Hopefully our minimalistic vision will hold because not only is it good for our wallet, it is also the responsible thing to do for the earth. Certainly not in my pocket. Perhaps under the bed? No, that's just a cat. As we watch the markets collapse, homeowners lose homes due to foreclosure, and retirement funds dwindling, it makes me wonder: will I have the energy to work UNTIL I AM 80??? I hope not. I really really hope not. But while The Prof and I have decent paying jobs, make all of our payments on time, and have just enough left to throw in savings, I still feel the belt tightening. And no, it's not my widening belly. What is happening? I think we are spending less. We try not to eat out too much. Rarely do I go shopping. What gives? Is food that much more expensive? Does the price of gas really hurt that much? What are we doing wrong??? 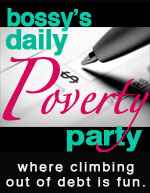 If you will turn your attention to the right of this blog, you will note Bossy's Poverty Post badge! Because of my work, I completely support this endeavor. And because of my support, I will try to post my attempts to decrease debt, save money, and live a more modest lifestyle. That is something we all should probably be doing.